Sealing seams, cracks and joints. 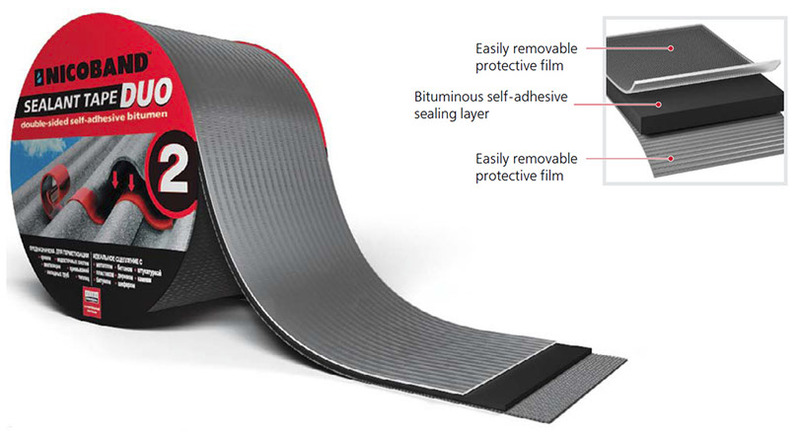 NICOBAND DUO is a double-sided self-adhesive polymer-bitumen tape for sealing hidden seams and joints, for temporary fastening or for the simultaneous fixation and sealing of small elements. NICOBAND DUO consists of a polymer-bitumen layer of a special composition that provides good adhesion to virtually any surface. On both sides it is protected by polymer films, which are easily removed. The material is easy and convenient to apply. Has excellent adhesion to metal, concrete, plastic, asphalt, wood, glass, etc. The surface must be clean, dry, and free from rust and dust. For a better and more durable bond a priming of the base is recommended. The surface and material temperature must be at least +5 °C. At lower temperatures it is necessary to heat the adhesive side of the material and the base. It is not recommended to apply a tape to hot vertical surfaces (with a temperature above +85 °C). Store in a place protected from atmospheric precipitation and direct sunlight.